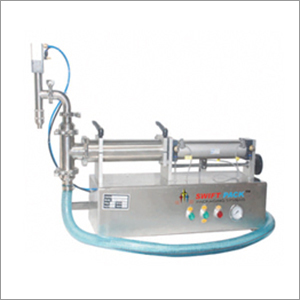 Our company has an eminent image in the market as the best liquid filling machine supplier and manufacturer from India. If you are looking for the best supplier of filling machine in Delhi, then we, Shri Vinayak Packaging Machine Pvt. Ltd. are the company to deal with. We offer dimensionally accurate and high performing machines which are eminently used for filling free flowing liquids. Electromechanical integrated controls is the key trait of our liquid filling machinery. Its design is in compliance with the international concepts and standards. It is primarily used in various corrosive, viscous, non-corrosive and non-viscous liquids. The application areas of this filling equipment include quantitative small packages of chemical liquids, lubricants, vegetable oil, and regular chemical industry, to name a few. We have acquired special manufacturing license and hence are doing legitimate business of fabricating the liquid filling equipment as per government guidelines and norms. We have acquired competent machining ability, which allows us to offer customization facility to clients.